The original World Trade Center PATH (Port Authority Trans-Hudson) Station, opened in 1971, was destroyed in the 9/11 attacks when the WTC towers collapsed on top of it. Its replacement, the World Trade Center Transportation Hub, is a mega-terminal on the scale of Grand Central Station—under the new WTC complex. "The Financial District used to be, at some point, part of the Hudson. We are in a lot of landfill area; Battery Park Station and the World Financial Center are built on landfill," Eduardo DelValle, Director of Design Management for 1 World Trade Center told us. "This whole 16 acres is walled in by slurry walls, and they're designed to keep the Hudson from coming in because the water table here is very, very high. Within two feet [of digging down from street level] we're hitting water." The slurry wall or "bathtub" method involves digging a trench and filling the resulting space with a mixture of bentonite and water, which temporarily plugs holes and keeps groundwater from penetrating. When the trench is completed, workers insert a steel cage into the trench and pump in concrete, which forces the slurry mix out, resulting in a water-tight retaining wall. When the WTC towers fell, many of the floor slabs that supported the original slurry wall were knocked out, leaving just the debris pile itself to keep the wall from collapsing. As excavations of "The Pile" commenced, the wall's support structure was removed and, over time, due to the intense water pressure exerted by the Hudson, sections of the wall ended up shifting as much as a foot inward and caused a massive crack to form in one section of the slurry wall—leaking of anywhere from 100-200 gallons per minute in places. Work crews immediately back-filled huge amounts of soil to bolster the wall. They then plugged the leaks by pushing rope treated with an expanding chemical into the holes and stopped the wall from further cracking by pumping in a strong sealing paste. Workers also excavated a series of wells outside the wall to lower the groundwater level, thereby reducing pressure outside of the wall. Intruding water was summarily pumped out. The new slurry wall being built around the 16-acre WTC complex not only provides protection from the Hudson's waters but also acts as a foundation for the new transportation hub's lower floors. Its three-foot thick walls extend 70—100 feet into the Earth, pass within six feet of the new train tunnels and are anchored into the bedrock with approximately 1,000 cable tie-backs. It did, however, suffer similar water intrusion damage with Hurricane Irene. "Water was just gushing in," said DelValle. Since the original wall's structural integrity had been repeatedly compromised, the WTC design team determined that a second layer of protection was necessary, "so what we're doing is putting in liner walls," DelValle continued, "which is a another slurry wall in front of the old, providing another layer of protection." When you think of an underground transportation facility, the image of a child's hands releasing a bird into flight shouldn't be the first think you think of—third, maybe, after Mole Men and Crab People—but that is exactly what famed Spanish architect Santiago Calatrava based the new canopy cover of the Transportation Hub on. The Hub entrance—aka the Oculus—is comprised of 300 pieces of steel erected in a rare, Vierendeel Truss design that features a pair of 150-foot-high "wings" suspended over a glass and steel "body"—built from two sets of specially-designed arches, each weighing between 10-25 tons and standing over 30 feet tall—that allows natural light to penetrate to the rail platforms more than 60 feet below street level. The steel beams were manufactured numerous locations including New Jersey, Pennsylvania, South Carolina, Canada and Spain. "The building is built with steel, glass, and light. They will all be equal building materials," says Calatrava in a press release. "The light will arrive at the platform, and visitors will feel like they are arriving in a great place, a welcoming place." 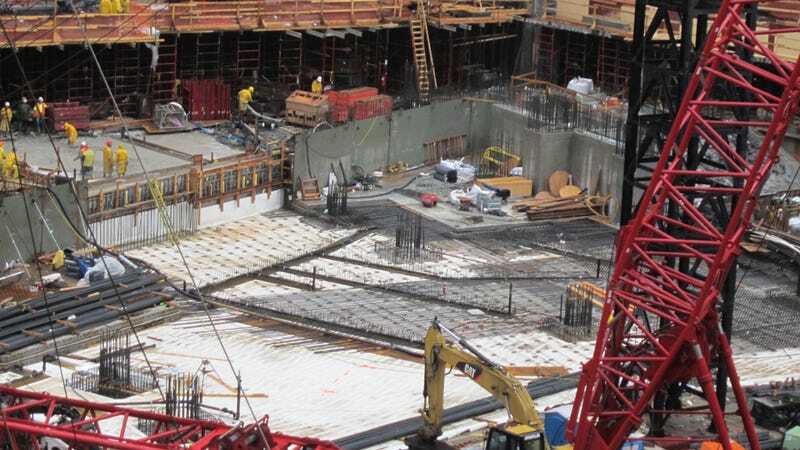 The deck-over construction method was employed to ensure that the Memorial Plaza would be ready for the upcoming 10th anniversary of the attacks and 9/11 Memorial opening. The station itself is expected to open by mid-2014, according to the Port Authority. Lower Manhattan is set to become the third-largest transportation center in New York when the World Trade Center Transportation Hub is completed. It will house the PATH lines, 13 subway lines via the Fulton Street Transit Center through the Dey Street Corridor, and link visitors and locals alike to the World Financial Center through the most integrated network of underground pedestrian connections in all of New York City. In total, pedestrians will be able to access the Battery Park City Ferry Terminal to the WTC Memorial, Towers 1, 2, 3, and 4 as well as the Hudson River ferry terminals, the World Financial Center, and the proposed rail link to JFK Airport from the same central hub. Located near the northeast corner of the WTC site between Towers 2 and 3, the Hub itself will be 300,000 sq. ft. and include a multi-story central hall that includes a lower concourse with balcony walkway above it (a la Grand Central Station) as well as a public waiting area and 500,000 sq. ft. of retail and dining space. It will be able to accommodate many as 250,000 riders a day—compared to the paltry 50,000 the temporary station currently can handle—as well as the millions of annual visitors to the new World Trade Center complex and 9/11 Memorial and Museum. The entire Transportation Hub interior will be generally free of vertical columns, on account of the two massive plate girders—each 7 feet high and 143 feet long—that sit atop four super-columns, resulting in a greater sense of openness through the concourse. It will also feature three full-service, climate-controlled, 10-car platforms with five tracks, in addition to an additional platform to accommodate any future service lines. In all, the Hub will consume over 22,000 tons of steel—roughly as much as the USS New York—in its construction. It's being financed via $1.92 billion from the Federal Transportation Agency with the Port Authority picking up the rest of the bill. The Hub promises to revolutionize how New Yorkers access Lower Manhattan and the greater NYC area.